What's replayKit? We can record videos in runtime and share the video outside of the app?? o_O If that's the case, it would be G-R-E-A-T!!! Yes you can record the screen at runtime. Just start recording when player starts playing, when gameover just stop recording an new window will open where the player can watch, edit and share the video. Wow!! That's AMAZING!! You're an asset to Stencyl, Robin. I feel so bad I'm unable to help you by donating. I wish the situation changes soon. Awesome, bought and trying it out now. EDIT: Ok so it works perfectly and was no problem to set up whatsoever. Great work!! Thanks enjoy if there are any issues just let me know..
Oh my! I will definitely be buying this!! AMAZING job!! Edit: I have one problem with this though, is there any way you can make it work with other devices such as iPhone 4, iPod 4 and 5, iPhone 4s? I would need that workable for the extension before I could actually use it. Amazing! Downloaded and works great. This is going to be SO useful for me. I build kids games, and this is a great way to analyse their interactions, as it can record their chatter while they play. Thanks, great work and well worth the cost. No it is only working on devices with A7/A8/A9 Chipsets, that is how Apple made the Replaykit SDK..
What's the game? Is it something you're working on? Yeah, it's called Magic Mansion, it's p brutal. Coming out soon! This is a fantastic extension! I works perfectly. One thing though, it seems to crash the app on start up when using a device that uses iOS7. 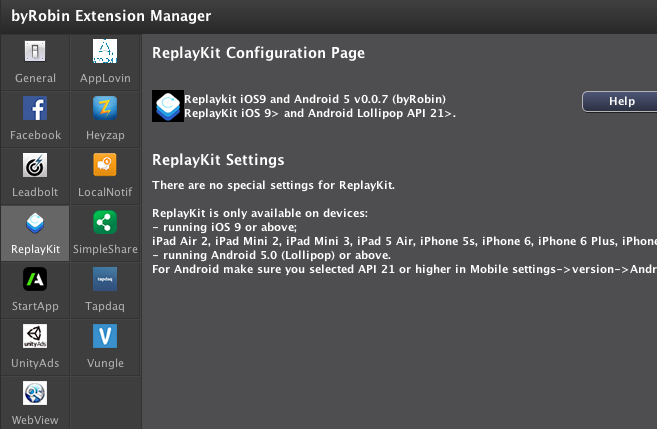 I've got the replaykit available bool on all the buttons that need it as well. Any ideas? Ok thanks for mention this. I was only focus on iOS9 so i forgot to Weak Linking the ReplayKit Framework. I have update this Extension to 0.0.2 to fix this issue. I have Weak Linking the ReplayKit Framework, this means the Framework is optional. To make it optional, devices on iOS8 or lower will not crash anymore.